Sam Flood, a recent University of Tasmania Pharmacy graduate, with above average marks, and a real commitment and passion to work in the pharmaceutical industry was reasonably optimistic about his chances of securing employment late last year. However, eight months on, forty unsuccessful applications and still no internship is leaving Sam frustrated and wondering what more he can do to get a foot in the door. So what’s going wrong? It seems what is holding Sam back is not his ability, competence or potential to do the job. It’s the fact that Sam has a disability. Unfortunately, Sam is not alone. Graduate Careers Australia research finds that if you have a disability you are more than twice as likely to be unemployed, compared to graduates without disability. 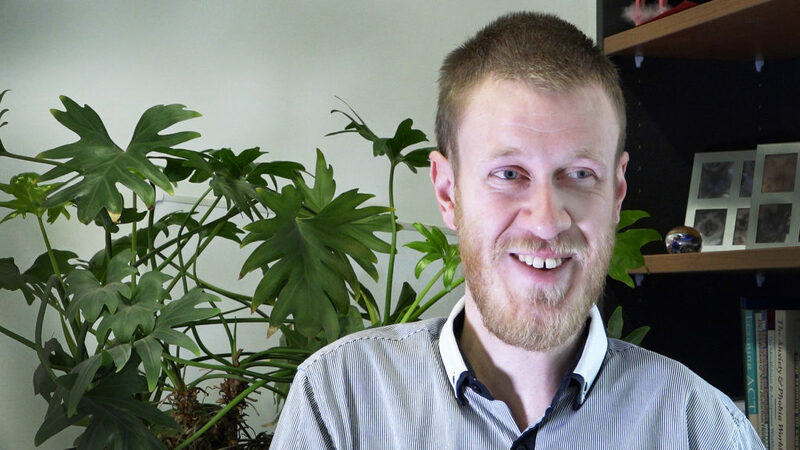 Sam, graduating with a Bachelor of Pharmacy shares his story in an interview. University qualifications are generally widely regarded as a way of increasing your career prospects and realising your aspirations, and the numbers of Australian university students with disability has been steadily growing. And with the introduction of the National Disability Insurance Scheme giving people choice and control over their support to live the life they want to live, it is hoped that more people with disability will pursue the option of higher education. However, are we letting these students down if their graduate employment outcomes remain persistently lower than other graduates? “Universities have a responsibility to provide inclusive education, and to ensure that there are equitable pathways into sustainable and appropriate employment once students complete their degrees” said David Swayn, a National Disability Coordination Officer from Northern Queensland. Overall, Australia doesn’t have a good track record when it comes to the employment of people with disability, and is ranked twenty-one out of twenty-nine other OECD countries around the world. Not only are people with disability more likely to be unemployed, but many of them feel that employment isn’t even a real option. With just over half of people with disability, 53.4 % participating in the labour market, compared with 83.2% of the population without a disability. A report by Price Waterhouse and Cooper suggests that one of the the biggest barriers is employer’s lack of awareness and attitudes, and turning this around is not only a matter of natural fairness and human rights, but it will also increase the productivity of our economy. The Australian Government currently fund the Disability Employment Services (DES) to help people with disability find and maintain a job. DES providers have specialist knowledge and skills around working with people with disability and the government incentives available to employers. However, according to the ‘Willing to Work’ publication released by the Australian Human Rights Commission, DES is in need of significant improvement. It seems that over forty percent of their participants remain unemployed or feel they don’t achieve any positive outcome from their assistance. And when it comes to graduates, they are even less confident about securing successful outcomes. This may be in part because most of the leverage they have is with small or medium businesses. On the other hand, universities around Australia have strong careers teams with good relationships with larger businesses seeking potential graduates. But when it comes to assisting graduates with disability, they lack the expertise on what it takes to overcome negative attitudes to employing people with disability. Is there a way to combine the best of both services? A new service, the University Specialist Employment Partnerships (USEP) is trying to do just this. This new innovative program is establishing an on-campus specialist recruitment service that links a Disability Employment Services (DES) consultant with university career advisors. An initiative of the National Disability Coordination Program, it begun at the Griffith University with employment partner Mylestones Employment on the Gold Coast in 2017. Since then the model is keenly being taken up by other regions around Australia, including a partnership between James Cook University and Mylestones Employment, and the University of Tasmania and the ORS group. 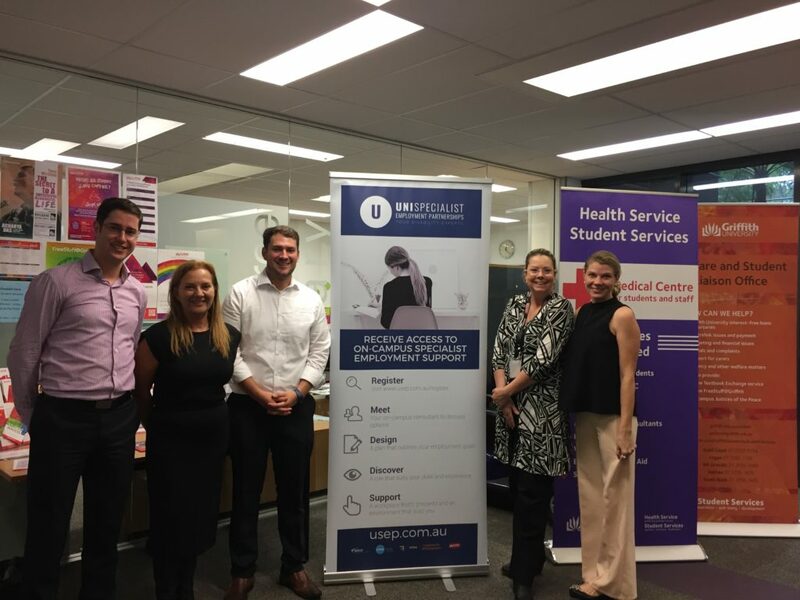 The USEP banner at Griffith on the Gold Coast with team members from Mylestones, JobAccess and co-creators David Swayn & Alisha Larkin. “It’s a great way to give students with disability in their final year or students who have recently graduated access to the best available advice to help them find work that is appropriate for their skills” said David. “And we are complementing the program with a comprehensive website with the latest tips and advice for graduates, DES providers and university career teams around Australia to access for free, funded by the Australian government’s National Disability Coordination Officer Program”. “I know my future is bright if I can just break into the market, but it’s been difficult trying to figure out for myself what it would take to get employers to give me a chance”’ said Sam. “Having a specialised disability graduate employment team to support me would be invaluable”. As you may know, I’ve been hunting for a pharmacy internship position for the last year or so after graduating with a Bachelor of Pharmacy in December 2016. There was a renewed interest a few weeks ago after a video I was invited to film with University Specialist Employment Partnerships (USEP) was uploaded. It’s been a busy couple of weeks with some big decisions made, but I’m happy to say I’ve accepted an internship at Capital Chemist Coburg North in Melbourne! To find out if a USEP partnership is an active trial in your area, visit our registration page.